Gardening zones are important to know if you want hardy plants. The following information has been reproduced through the courtesy of the U.S. National Arboretum for your convenience. Gardening zone figures are not fast rules, however, since Mother Nature can be temperamental. They are merely for your guidance. It follows that if you are to succeed in cultivating your chosen plants, your environment must meet their basic necessities. The 2012 hardiness zone map below features the average yearly lowest temperatures projected in the United States and Canada for the years 1976 through 2005. Find out your lowest temperature and compare it with the chart above, and you will know what garden zone you are in. Winter is an important time to make your soil and spring gardening productive and enjoyable. For example, you can cultivate ground covers to boost the nutrients in your soil for spring planting. There is the compost pile that goes on with its decomposition to further help make your soil ready. Additionally, plants abound that can be grown indoors and outdoors during fall and winter. Knowledge of your gardening zones come in very handy as you plan for winter gardening. 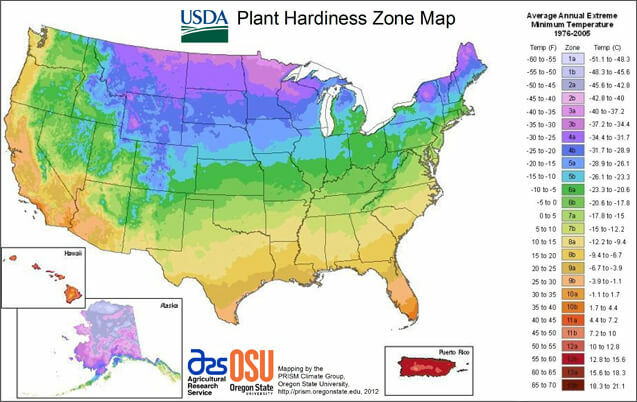 Zones 2-10 in the USDA Plant Hardiness Zone map have been subdivided into light- and dark-colored sections (a and b) that represent 5°F (2.8°C) differences within the 10°F (5.6°C) zone. The light color of each zone represents the colder section, the dark color the warmer section. Zone 11 represents any area where the average annual minimum temperature is above 40°F (4.4°C). The map shows 20 latitude and longitude lines. Areas above an arbitrary elevation are traditionally considered unsuitable for plant cropping and do not bear appropriate zone designations. There are also island zones that, because of elevation differences, are warmer or cooler than the surrounding areas and are given a different zone designation. Note that many large urban areas carry a warmer zone designation than the surrounding countryside. Acid rain, gaseous and particulate pollution, security lighting, and toxic wastes, among many other stress factors, have significantly increased the potential for unsatisfactory performance of landscape plants. Another stress factor is insufficient irrigation. Be especially mindful of garden plants that do not have extensive root systems. Wind can be damaging. Protect your plants with windbreakers, if necessary. New techniques of planting, transplanting, watering, fertilizing, and providing pest control measures have done much to increase the vigor of landscape plants. Used unwisely, these same measures can reduce plant hardiness. Watch out for signs of deficiency and excessive fertilization such as weakening resistance to fungus, drought, and stunted growth. If your garden has deficient soil, consider a fall application of fertilizer high in potassium. These are identified as expressways, malls, elevated decks, and buildings where plant roots are totally removed from the ground and its warming influence. The assortment of plants that can adapt to such environments is proving to be very restricted. Hardiness ratings alone are inadequate to guide landscapers in selecting the most successful plants. The day length is usually the most critical factor in regulating vegetative growth, flower initiation and development, and the induction of dormancy. Plants survive only when the day length promotes their growth and prepares them for the seasonal changes. If your garden has plants that do not fall into dormancy in spite of day length, do not apply nitrogen in the early fall. This will cause them to be more prone to winter injury. Plants differ in ability to survive frost. Their responses vary from immediate death to sustained performance. The previous environmental and cultural conditions of plants can often shift, but not permanently alter, their tolerance to freezing. Plants survive only when they are adapted to subfreezing weather. Consult your gardening zone map. If your area is colder than other places around you, it is a good idea to cultivate plants that can adapt to lower temperatures than yours. This is especially helpful since no one can really prevent an extremely harsh winter weather from dropping in. Maps on gardening zones are handy, but it is wise to remember they are merely for guidance and not hard fast figures.